Look: it’s not always easy to score new clients online. Even if you’ve been able to acquire a steady stream of clients in the past, experiencing a lull in your business can take the wind out of your sails. It’s okay. We’ve been there, too. Don’t lose hope. Instead, start taking action with a buzz-free, realistic approach to landing clients who are the perfect fit for your business. We’ve crafted a 21-day marketing plan so you can start working to get your first (or next) paying client ASAP. All of this within 21 days. Even if you’re running on no hope, no clients and absolutely no idea what to do moving forward, these 21 days could potentially transform your business. First thing’s first: this guide isn’t about spending thousands of dollars. In fact, it’s about getting the absolute most out of the free marketing channels available to you. Despite popular belief, your website and Facebook are more than enough to effectively create a powerful client base these days. If you think that the tools to effectively market your business have to break the bank, think again. You’re already sitting on a potential goldmine. Many small businesses and solopreneurs alike figured out strategies and formulas to make these platforms attract clients without fail. The biggest mistake that newbie marketers make is having way too much going on throughout their homepage. Too much text, too many images and nothing that drives visitors to take action and book your services. The key to converting website visitors into customers is simple: ask them to get in touch with you. A crystal clear call-to-action widget can go a long way in turning your seemingly random visitors into future customers. This widget was developed by the vCita team to help SMBs turn visiting traffic into dollars and cents. It was designed to instantly grab visitors’ attention without disrupting their browsing experience on your website. The widget can be seen from every page on your website and prompts visitors to contact you by reminding them of the quality and value of your services. 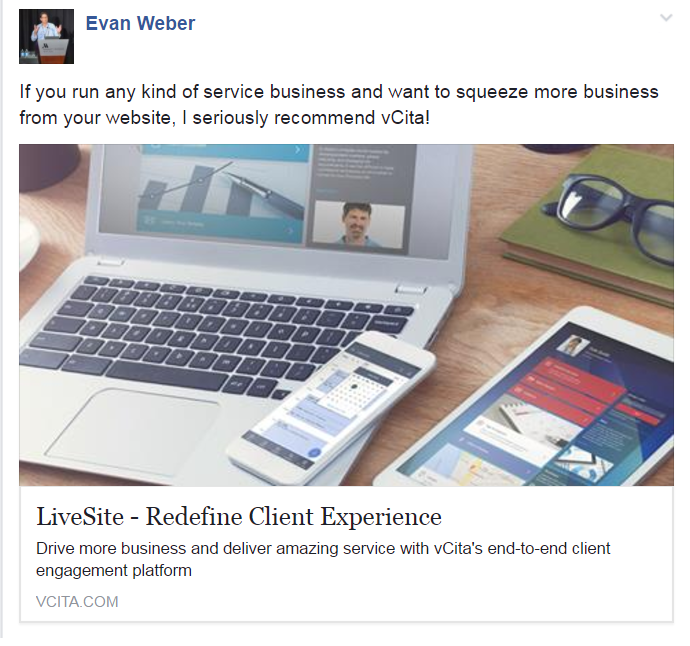 Judging by their Facebook reviews, vCita’s widget works like charm. And even better, you can use it for absolutely free to capture leads on your website. For a small monthly fee, you can add more revenue-focused call-to-actions like “Book Now”, “Register to My Workshop” and even “Pay Now”. Click here to see vCita’s widget in action. Everyone is on Facebook. On average, your customers will be spending more time on Facebook than anywhere on the web, meaning that a strong presence on the social network is not an option: it’s an expectation. But how do you make your profile stand out? 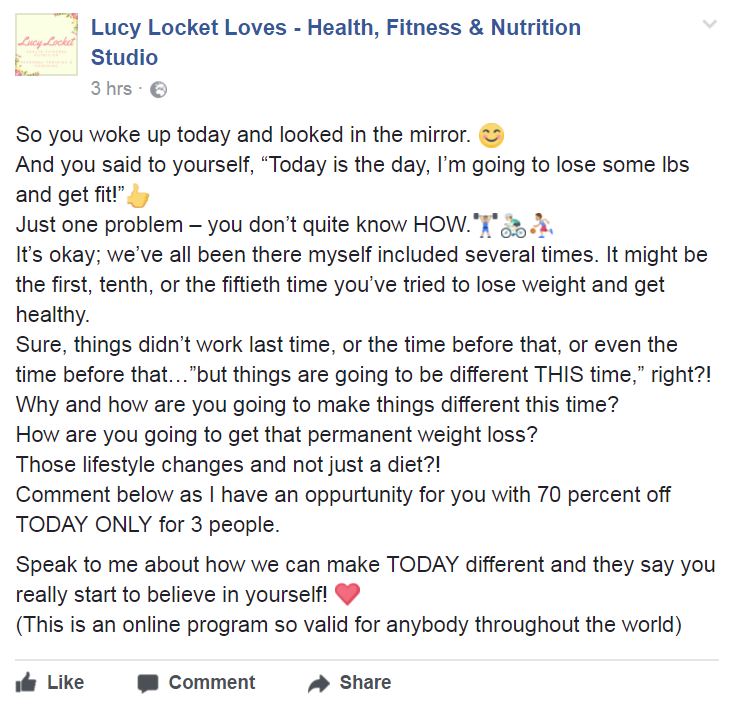 Well, let’s say you’re starting from scratch and only having your existing network of friends, family and work buddies to work with. Start by uploading a photo of yourself which is both warm and welcoming. Customers react more positively to images of people versus logos, so keep that in mind. Throughout your profile, make sure to emphasize your passion and expertise in your field. Also, don’t forget to link to your website. 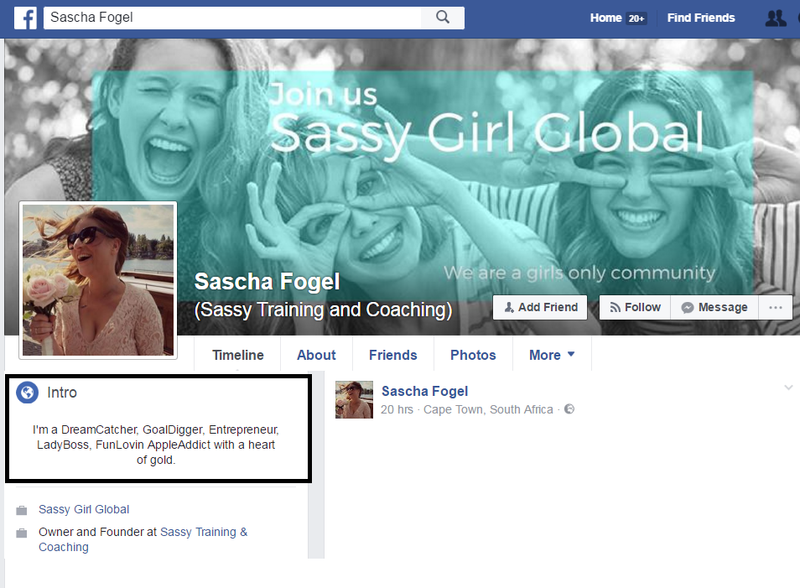 For example, Career and life coach Sascha Fogel, created an intro that is the perfect blend of fun and professional. Don’t be afraid to show off your personality (whether it be wild or quirky) in your introduction; however, you should also strive to remind visitors that you’re indeed a professional. Next up, you’re going to need to add some photos. After all, we live in a digital age where seeing is believing. People are much more willing to spend their time scrolling through photos versus a giant wall of text. Create a photo album that shows you in the field with your clients or otherwise hard at work. Include short but sweet descriptions to accompany each photo. For example, a professional massage therapist may upload an image of themselves working with a client with the caption “Freeing the world of pain, one back at a time”. It’s also common to take screenshots of thank-you letters and emails from past or present clients. These photos represent powerful social proof that shows your visitors that your business is the real deal. Before you start communicating with potential clients on Facebook, there’s something basic that you need to understand. Seriously: most marketers screw this up. If you want to win clients, you have to teach yourself to think like a client. Think about it. Most people are drawn to professionals who truly understand their problems and effectively come up with solutions. They’re not interested in a sales pitch: what they need is a problem solver. Seriously, this could potentially transform the way you do business and speak to customers forever. Stop talking so much about what you do and instead teach your audience how you can help them solve their problems. Be a knight in shining armor. Your business should reflect your clients’ problems and present yourself as the solution. This is what you need to provide. Simple tips and offers that solve problems. That’s all. The next step is picking your clients’ brains and figuring out what makes them tick. After all, you can only solve their problems if you know what their problems are. In short, there’s no harm in asking your current and past clients for feedback. Shoot some emails explaining that you’re trying to grow your business and want to see what value you can offer future clients that’s currently missing. Chances are, your clients will have no problem answering such a question. Then again, it never hurts to butter them up a bit (let them know that you value their opinion or perhaps offer them a future discount, for example). What was the biggest fear they had before approaching you? What barriers held them back from buying from you outright? Why did they choose you over someone else? What improvements in service would they like to see? Another option is to post a survey on your Facebook profile and ask family and friends what they think your target clients’ pain points are. Social users love to voice their opinion and you never know, perhaps one of your friends can offer some nuggets of wisdom or need your services themselves! Quora is a question-and-answer forum, plain and simple. 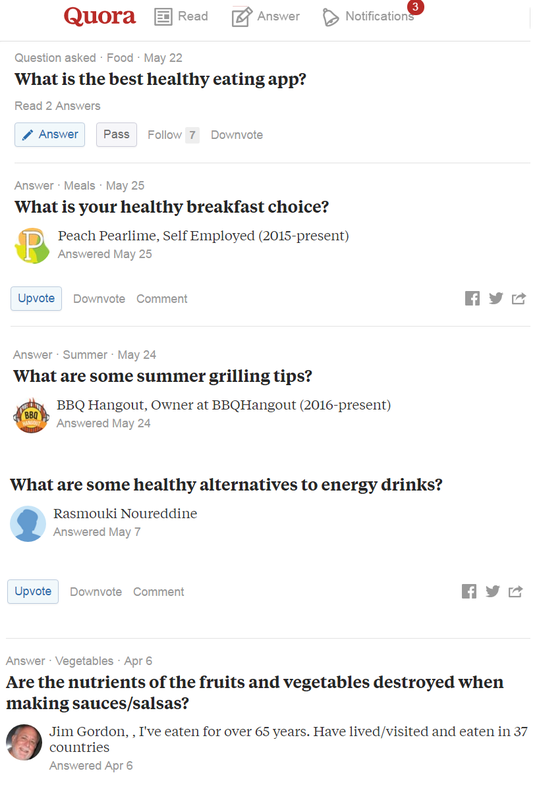 If you search “healthy eating + Quora” in Google, for example, you’ll get a laundry list of eating-related questions by people who may be your potential customers. You’ll need to dig through different questions to find your specific problems for your clients. A good idea is to open up a Word document and copy-paste the questions that your ideal clients are facing. If you see the same questions pop up time and time again, highlight them. These are clearly the major pain points of your clients. Bear in mind that this is a general query. If you have some idea of what your clients are struggling with, you could use niche language and keywords to really hone in on their concerns. Chances are, the answers you’re looking for are there if you take the time to look for them. 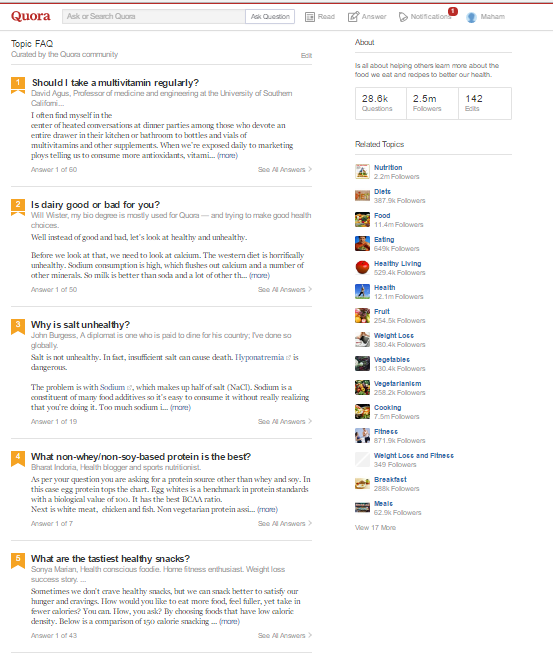 By the way, using Quora has another great benefit: the ability to review the questions of others. This provides insight on what types of content you should create. For example, a health coach can easily base a series of videos on the “tastiest healthy snacks” question referenced above. Yes, it’s really that simple. Again, step into the shoes of your clients. Once you start thinking like they do and marketing accordingly, you really boost your potential to grow your client base. Let’s talk about finding clients on Facebook. 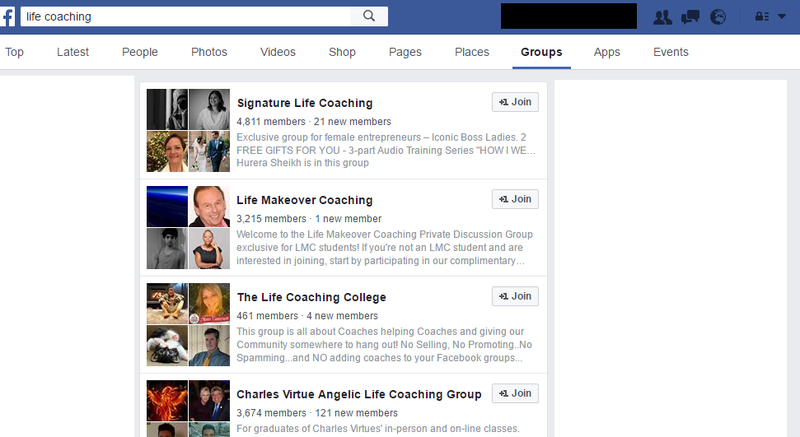 Facebook Groups are the best place to find, attract and convince clients that they need you. 1. 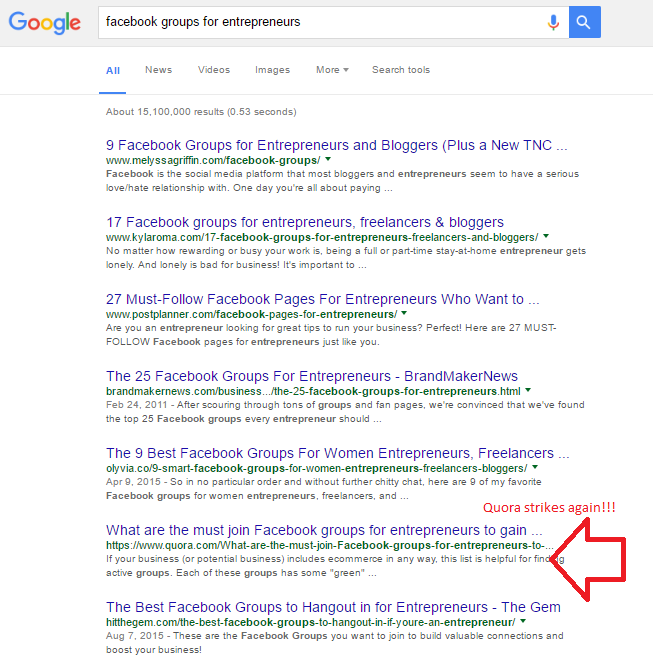 Search for niche-related keywords in Facebook’s search bar. Then, use the Groups filter to find relevant groups to your industry. Also, make sure to search for local groups in your industry to uncover networking opportunities within your community. For example “Chiropractors in Alabama” or “Web designers in Chicago. Important: groups work on the principle of value. Everyone present in the group is expected to provide value and prove their worth. In other words, don’t spam by simply blasting links to your homepage and expect to gain traction. Communities thrive on users helping each other, and therefore that’s the only way you’ll get noticed in such a group. Alright, so you’ve joined the groups where your target clientele is hanging out. Now it’s time to show them why you’re the answer to all of their worries. Let them know that their ideal problem solver has arrived. 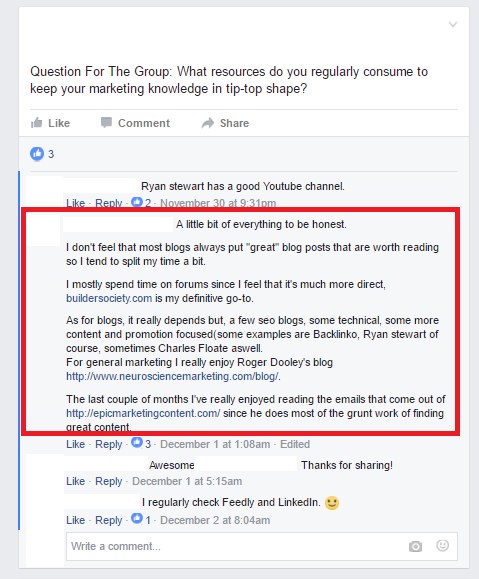 Once you’ve accepted into a Facebook group, it’s best practice not to immediately start posting and sharing your stuff. First, you need to understand the dynamics of that group and engage in ongoing discussions before posting anything yourself. Nobody is going to pay attention to some newbie from the word “go:” you’re going to need to slowly build up your reputation within the group by participating in ongoing discussions. Contribute something original to the conversation. Tell a story. Provide an anecdote. Participating in Facebook groups isn’t a one-and-done affair: it’s something that you’re going to need to do for the long haul. Your goal isn’t to be visible once or twice for the sake of a few clients. Instead, you should strive to establish your expertise and status as an authority in your niche. This takes time and continuous contributions over time. Although this may seem daunting, consider how you can knock out a few conversations a couple times per day in between breaks. It doesn’t have to be a massive commitment, but it should be something you do on a regular basis. Until recently, setting up a Facebook business page was the best way for SMBs to gain attention, but this isn’t the case anymore. Posts on specific pages are receiving less reach than ever, in some cases less than 1% of people who “Like” your page actually see your post. If you can’t afford to pay Facebook to boost some of your posts, consider using your personal Facebook profile. Although using your personal profile for your business is considered bad strategy by most professional marketers (and for some good reasons too), there’s no harm in starting marketing your business through your personal Facebook profile until you’re able to scale up to a full-fledged business page. Unlike Facebook groups, your personal profile is your own real-estate. You’re the ruler. Use it however you want, whenever you want but remember: do not post too often. Users value content more when it pops up occasionally versus being shoved in their faces 24/7. Be mindful not to spam your Facebook friends, either. The best profiles are the ones that find the sweet spot between professional and personal. Whether you’ll be posting content to your personal profile or business page, always remind yourself that you’re posting content for real people, just like you, who are themselves in search for real value, interesting facts or the occasional distraction. How do you uncover content worth sharing? Easy. Use Reddit or Quora to uncover common problems faced by your audience. 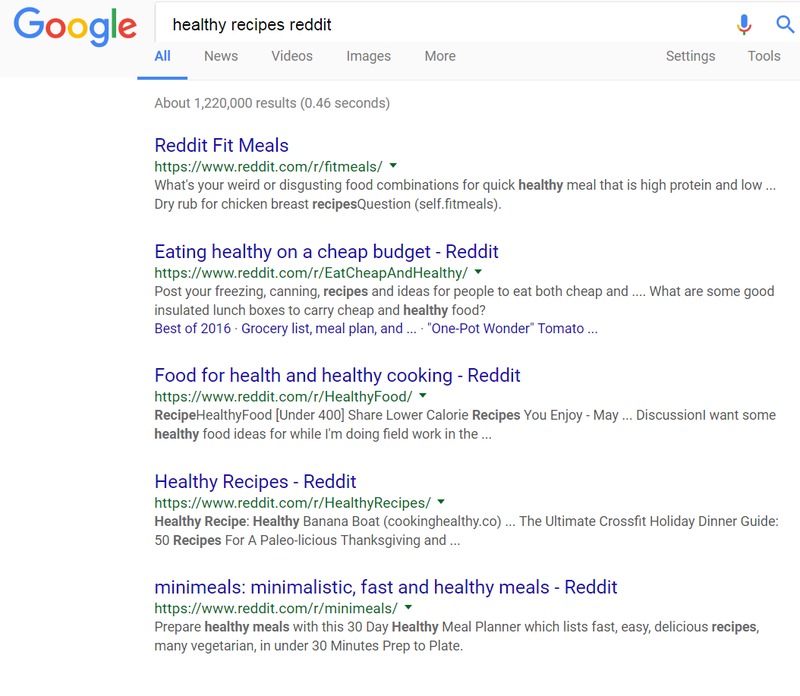 On the flip side, check out these results from Reddit via Google. By the way – If you’ve never heard of Reddit, you should take some time to explore this amazing online community. Reddit is the online home of millions of users who form communities around shared interests. Many people rate Reddit as their first go-to source for quick answers and information and if you visit one of their communities (or “subreddits”, as they call them) you’ll quickly see why. Another option is to check out the blogs and websites of influencers in your niche. If you’re not familiar with influencer marketing, don’t freak out: “influencers” are basically industry hotshots who attract huge followings via social media. Take a look at the blogs and Twitter feeds of big names in your industry to see what topics they’re covering. Then, offer your opinion on similar topics. Once again, it never hurts to ask. Ask others on your profile, within Facebook and every else you can: what do they want to know? What problems are nagging at them? Don’t be afraid to approach others and ask what they need. Transforming those answers into content can really help you stand out as a resource. Don’t be afraid to reveal your professional secrets. Are there any resources you use that you could share with your niche? Websites that are your go-to for saving time? Sharing tips and tricks are a surefire way to show that you know what you’re doing and get on the good side of your audience. We could easily create a short tutorial video explaining to our audience how to use Canva. Simple? Sure, but equally effective. Tools, strategies and other tips that might seem simple to you could indeed be your audience’s pain points. When in doubt, educate. Finally, organize all pieces of content you have into an Excel file with the dates in which you plan on publishing them. Not only will this keep you organized but also allow you to reuse your content effectively. Videos are your best bet considering they get the most engagement out of any type of social post. According to a survey by Social Bakers, video posts have 135% greater organic reach than photos. In other words, video has the most potential to get your business in front of new faces versus text posts or images. If you think that video marketing requires a professional studio and expensive equipment, think again. All you really need is a smartphone and a message that speaks to your audience. Really, that’s it. As long as you provide value through your tips and advice, they’ll come back. Your videos don’t need to be perfect, nor are they expected to be. 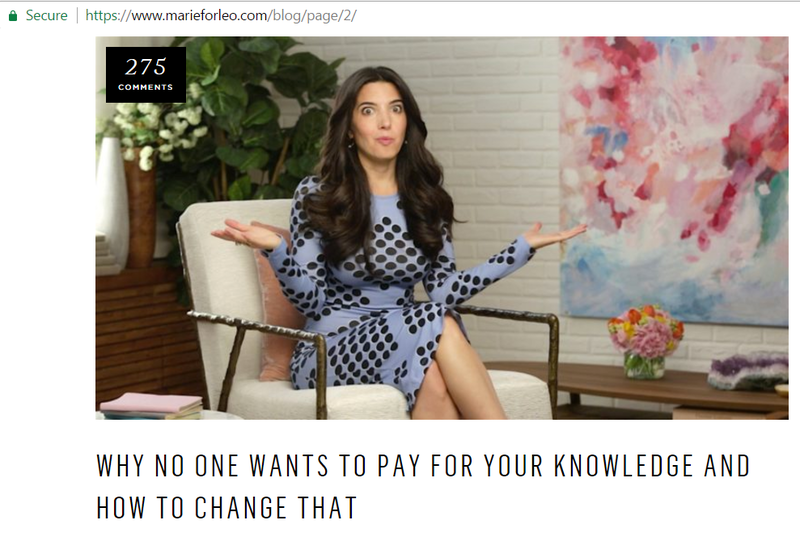 Over time, you may very well reach Marie Foreleo’s level of glam. By the way, now’s the best time to hop on the bandwagon of live video through Facebook Live. Broadcasting is a breeze and lets your followers know that you’re posting, which in turn means more engagement. If you’re hesitant to record yourself in front of a live audience, you can always shoot your video offline and upload it later. Here’s a guide to help you get started with Facebook Live. While Facebook is the king of helping you find new clients, don’t neglect other channels where you can cast your net. LinkedIn is essentially the go-to social network for companies to post positions. However, not all jobs are on-site: you can score freelance opportunities as well. 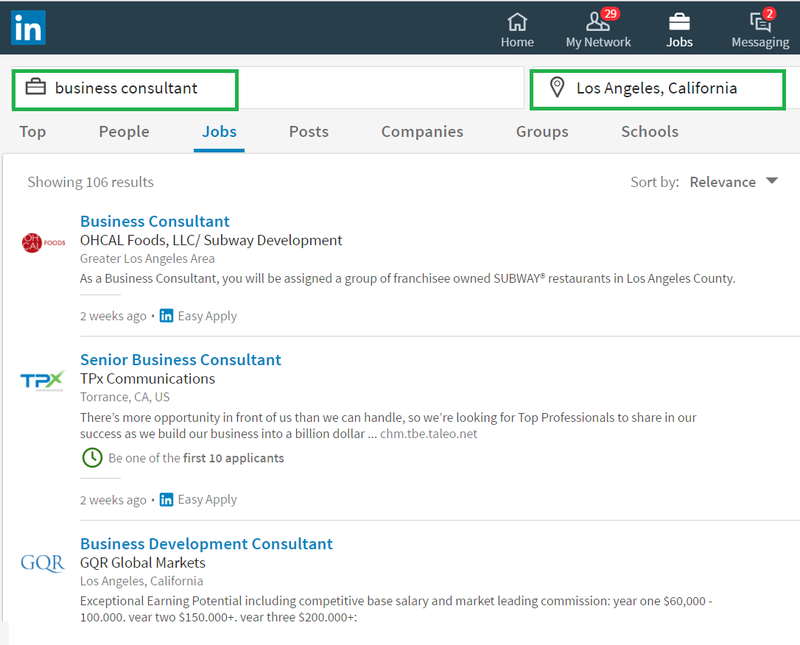 LinkedIn’s Job Search feature can help you uncover potential clients in the corporate world. Like any other search site, input keywords related to your niche and don’t be afraid to get specific. When you see something that catches your eye, simply apply. You can use your professional LinkedIn profile to get the most out of the content you’ve created for Facebook. Keep in mind that LinkedIn is a professional website and is somewhat less conversational versus Facebook. An active LinkedIn profile will not only help you get found via LinkedIn search, but also let those who find you from your website or Facebook know that you have an active online presence. 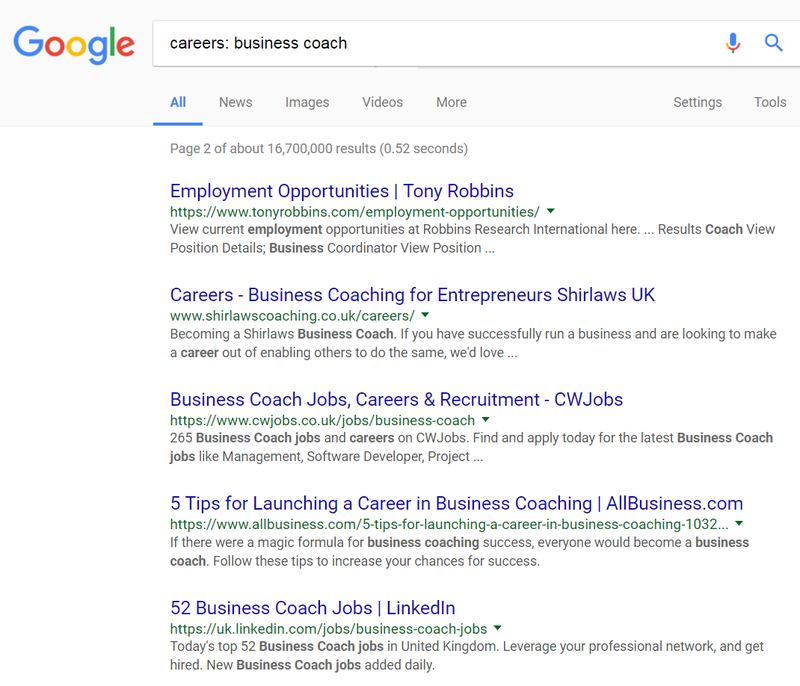 When it doubt, Google is always a solid option for finding potential clients. For example, you can search “careers: your service” to uncover job openings relevant to your niche. Most of the results are irrelevant, but the Tony Robbins’ result is solid gold: a great way to discover new opportunities and knock at new doors. Let’s say you’re short on time and need to drive some quick traffic to your business. 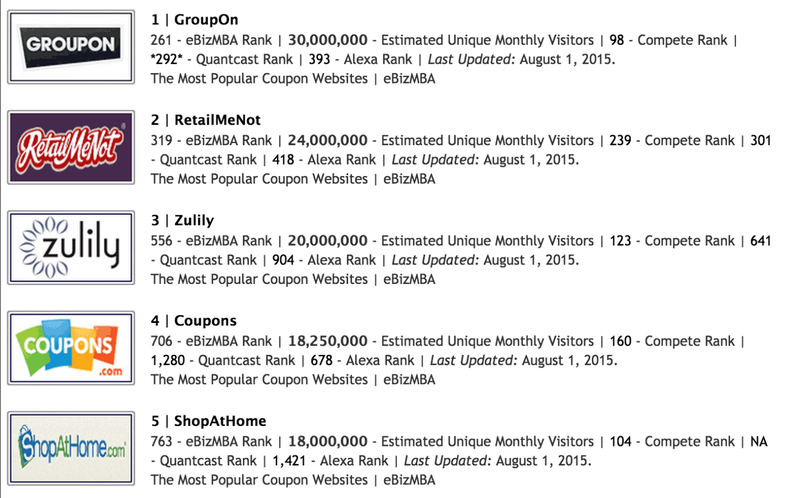 Here’s a cheat code that works for many industries: promote your service using a coupon site. Coupon sites provide an avenue for new audiences to find you that often goes unexplored by your competitors. According to the NRF (National Retail Federation), a recent study reported that “73 percent of American women have printed a coupon from a website, and 53 percent of consumers use daily-deal sites like Groupon or LivingSocial”. If you’re short on time and need a quick way to make some speedy sales (don’t we all! ), then promoting your services on a coupon website is your best bet. Coupon websites get massive reach and the chances of your target audience finding your service coupon are high. Since promoting your offer on a coupon website requires a small investment on your part, you will need to run some research to make sure you plan your offer well. Though advertsing on coupon websites seems (and can be) pretty straightforward, there are still a few factors to consider before taking the plunge. For example, if you’re an accountant, advertising yourself on a coupon website that focuses on travel and holiday won’t get you far. Likewise, advertising an offer that is highly similar to deals posted by countless other service providers in your niche can also flop. Make sure you understand how to distinguish your offer from the pack’s and help customers see the unique value of your offers. If you’re not sure how to do that, check out FitSmallBusiness’ great resource, Top 35 Coupon Advertising Ideas From the Pros. Quite the journey for 21 days, right? You’ve taken the time to understand your client’s problems. You’ve created the content that offers solutions. You have the keys to keeping your schedule full for months to come. But don’t forget: in order to run a successful business today, you need to constantly market your services. Hustle, hustle and then hustle some more. Once you adopt this mentality, you’ll never complain about business again. Remember: you have something unique to offer your audience and it’s your responsibility to make it known to the world. Now, we’d love to hear from you. How’s your journey coming along as a solopreneur? What’s your biggest hurdle in catching the eyes of new clients. Let us know!